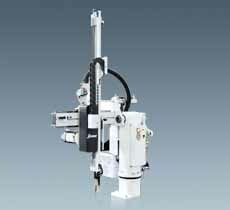 The SS1 series robot is designed for rapid and precise removal of sprue and runner from injection molding machine, and place them into granulator for recycling. Simple product removal is applicable with optional vacuum generator and EOAT. Suitable for injection molding machine under 250T clamp force. Fast mold changing design provides simple method for changing molds. The base is rotatable for 90o by releasing the handle. 3.2 inch true color LCD and graphical user interface automatically monitor and real time monitoring. Display error messages, easy to operate and ensure the use of safety. Extra extend I/O ports are available for other application. Teach program and setup cycle movements, provide plug and use without modify control system. Flexible and dialogic programming scheme offer 10 standard programs and 18 customized programs.